July 26, 2017 -- The City of Houston has dedicated the newest artwork to the City Art Collection—Books of a Feather, by Dixie Friend Gay. 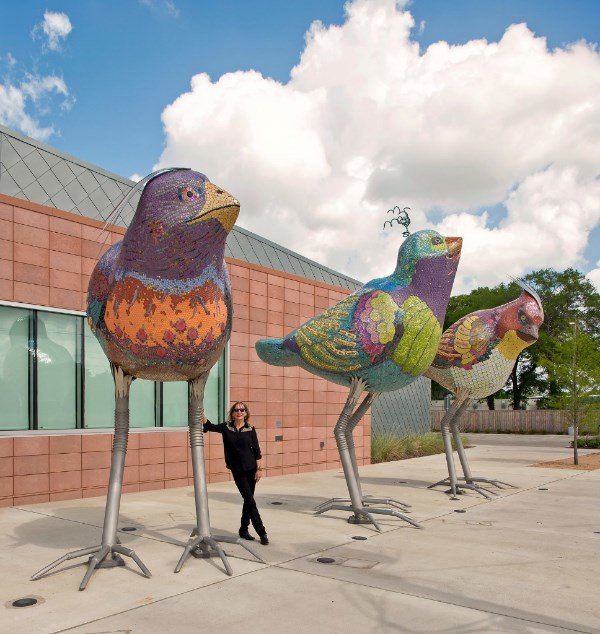 The monumental outdoor sculpture was commissioned for the Alice McKean Young Neighborhood Library and consists of three large scale birds made of steel and concrete ranging in size from 12 to 15 feet, each of which is covered with hand-placed, multi-colored glass and ceramic mosaic tiles that shimmer and sparkly when caught by the light, as well as hand-mad tiles stamped with book titles that include words associated with birds and flight. A lighting system illuminates the birds after sunset. Dixie Friend Gay is a nationally acclaimed artist whose career spans more than three decades and encompasses public art, sculpture, painting and drawing. Her work is fueled by an awareness of the natural world and its ability to produce new states of awareness and connection. Her public art has been recognized by Americans for the Arts “Public Art Year in Review” and has received multiple Craftsmanship Awards. In 2003, the Texas Commission for the Arts recognized Friend Gay as Texas Artist of the Year. She is well known for other public artworks such as Houston Bayou located in Terminal B at George Bush Intercontinental Airport. Her work can additionally be found in the collections of the Museum of Fine Arts, Houston, Rice University, Texas A&M Galveston and in several major airports and other public facilities throughout the U.S. The project is the result of more than a year of collaboration between the artist, HPL, building architect Perkins + Will, building contractor Gilbane and numerous Houston-based fabrication and supply companies. Friend Gay also worked closely with the General Services Department, which oversees construction for the City and Houston Arts Alliance, which is under contract to manage Civic Art projects for the City. The artwork is funded by the City of Houston Civic Art Program. In 1999, the City of Houston established an ordinance mandating that 1.75% of qualified Capital Improvement Project dollars be set aside for civic art. The program is managed by the Mayor's Office of Cultural Affairs. For more information about Young Library, please visit https://houstonlibrary.org/location/young-neighborhood-library.